The abundance of geysers, hot springs and other thermal features contribute to Yellowstone’s unique winter environment. Moisture from those thermal features combined with the cold winter temperatures create some amazing landscapes. 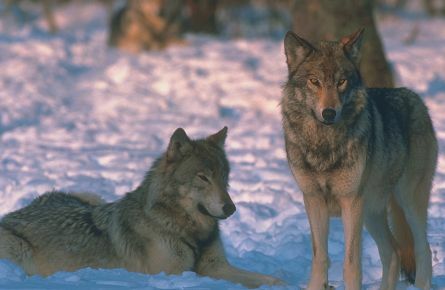 Because a blanket of white covers the ground, most of the larger mammals are easier to spot making winter a wildlife watchers’ dream. This educational adventure will include in-depth exploration (sometimes by cross-country skis or snowshoes, professional instruction provided) in a variety of winter habitats, including Old Faithful and the Grand Canyon of the Yellowstone. View the itinerary. *Rates do not include taxes, fees and gratuity. Package prices higher during Christmas Holiday (12/22-1/4). Minimum age of 12 years old. Minimum of 4 persons required for course to occur. Package is available every Monday starting December 16, 2019, ending February 24, 2020. 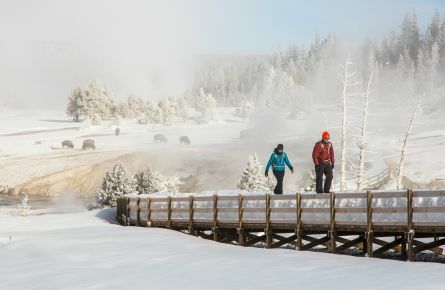 Guide to staying active while discovering Yellowstone’s stunning snowy landscape this winter. 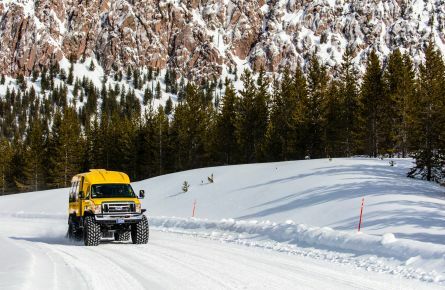 Yellowstone becomes a frost-covered wonderland during the winter months, and the travel experience is entirely different than during the summer season.